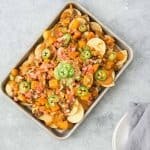 Vegan lentil Nachos with quick cheese sauce. Taco lentil filling, simple cashew cheese sauce, roasted squash, guacamole and more! Vegan and gluten-free. Heat a large deep skillet (or a large saucepan with deep sides) to medium heat with the olive oil. Add the onion and cook until translucent, about 5-10 minutes. Add in the garlic and saute for 30 seconds then add in the lentils, chili powder, cumin, paprika, salt. Mix so that everything is well coated, then add in the vegetable broth and bring to a boil, then reduce heat to a simmer, cover and cook for 25-30 minutes until lentils are tender and liquid has been absorbed. Add all of the ingredients to a high-powered blender and puree until creamy! This sauce will thicken up as it heats, so you can either keep running the blender to warm the sauce (My blendtec blender will do this on the ‘soup’ setting) or add to a small saucepan and warm over medium heat until thickened, about 5-10 minutes. Taste as needed with salt, sometimes I have to add a little more! Heat the oven to 400 degrees F. Coat the squash with the oil and spices and place in a single layer on a baking sheet. Place the tortilla chips on a single layer, drizzle on the cheese sauce, top with squash, lentils, pico de gallo and guacamole.